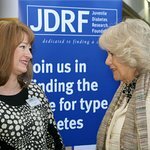 The UK branch of JDRF. JDRF is the type 1 diabetes charity, improving lives until we find the cure. It’s totally focused on type 1 diabetes, and is run by people with type 1, for people with type 1. The charity funds research to cure, treat and prevent type 1 diabetes. It provides information for children, adults and parents living with the condition, at all stages from diagnosis and beyond. It gives a voice to people with type 1 diabetes and campaigns for increased focus on, and funding for, research to find the cure. JDRF is a global organisation working towards the cure. Internationally, it is the world’s leading charitable funder of type 1 diabetes research. It works with academia, industry and governments to make sure that the research it funds has the greatest possible impact on the lives of people with type 1 now and in the future. Why not get involved with the world’s leading charitable funder of type 1 diabetes research and help find the cure for type 1? Google trends for "JDRF UK"
We don't have any videos related to JDRF UK.